I was in Nairobi a couple of weeks ago and took the opportunity to pop into the Sheldrick Trust and catch up with Kithaka, the orphan elephant that Real Africa has adopted. I arrived in the late afternoon, just as the elephants were returning from a day foraging for food in the adjoining Nairobi National Park accompanied by their handlers. Although the orphans receive four to five milk feeds a day to replace the milk from their lost mothers, they are otherwise expected to find their own food in preparation for their return to the wild from a “halfway house” camp run by the Trust in Tsavo National Park. I stood back against the large stockade, home to Maxwell the blind black rhino who was happily feeding on cut foliage on the other side. After a couple of minutes five small elephants appeared, walking, almost running, in single file along a path through the thick scrub. They shot past us without a glance, head into the yard and straight into their pens. A couple of keepers were to hand to shut them in. Walking back into the yard I could see several keepers busy giving the elephants their milk, served in what look like oversized baby bottles. Some of the babies who were impatiently waiting their turn had their trunks stretched through the wooden barriers, feeling around in buckets that were hanging outside, hoping to find their milk. I walked down the yard to the stable where Kithaka was. 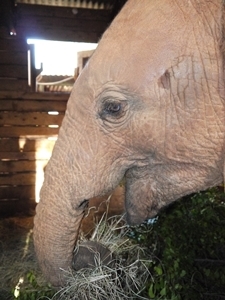 Born on October 2011 Kithaka is renowned for being one of the most mischievous of the orphans. This fact was confirmed by his handler that night, Eugene. He’d already had his milk and was now feeding on foliage that had been cut for him. I gave him a quick rub behind a very muddy ear before leaving him to his meal. He seems to have recovered from a recent scare when foraging alone in the forest and coming across a large python. He ran out screaming and took some calming down, especially when all the other orphans caught on and started howling as well. He’s also got over a mystery illness for which antibiotics were required and is back to normal causing havoc. This included giving the orphan Daphne a trunk hug and trapping a nerve in her neck. She’s now recovered too. 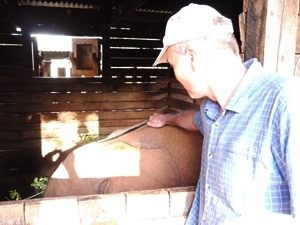 Eugene explained that the handlers rotate round every few days so that no orphan gets too attached to any one of them. 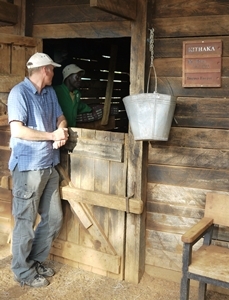 It was Eugene’s turn with Kithaka, and that he’d be sleeping in the raised bunk in the stable to ensure he was OK during the night and to give him his night feed. I was leaning on the stable door, talking to Eugene who was sitting on the bunk. 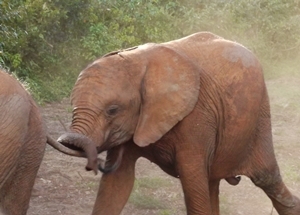 Kithaka decided to join in by turning to face us and sniffing with his trunk. He soon decided we weren’t as interesting as his food and continued with his meal. Saying goodbye to Eugene and Kithaka, I dropped down to Edwin’s office to make our donation to the Trusts anti-poaching work. It’s such a well-run and thoroughly professional outfit, where the elephant orphans seem so content, it’s hard to remember that they’re all there because of the actions of man, that their lives all started with incredibly traumatic experiences. As I left I was reminded of this. In a stable near the office was a tiny elephant only a week or so old, found a couple of days previously by the body of his mother. He was scared and upset, getting comfort from a gentle handler who was with him. Hopefully in a couple of years’ time he, like Kithaka, will be happy and well down the road to being reintroduced into the wild. Previous PostElephants on Wimbledon Common!Next PostBeach Retreats With A Difference? Africa’s Great Lakes. As a fellow adoptee of Kithaka, it’s nice to see how my boy is doing. I wonder how far and wide, we his parents are spread throughout the globe? Would be good if we could all communicate with each other, as we have a common link.